A healthy diet may lower your risk for heart disease, which is the leading cause of death in the United States. Consider including shellfish, such as octopus, as part of your heart-healthy diet because of their essential vitamins and minerals, as well as their omega-3 fats. An overall balanced diet is the best approach to preventing chronic diseases. Omega-3 fatty acids are polyunsaturated fats. They include alpha-linolenic acid, or ALA, which is a short-chain omega-three fatty acid,the long-chain fatty acids called docosahexaenoic acid or DHA, and eicosapentaenoic acid, or EPA, according to the Linus Pauling Institute Micronutrient Information Center. These fats may lower your risk for cardiac death, and the daily value for ALA is 1.6 grams per day. You should also shoot for an intake of 250 milligrams per day of EPA and DHA. 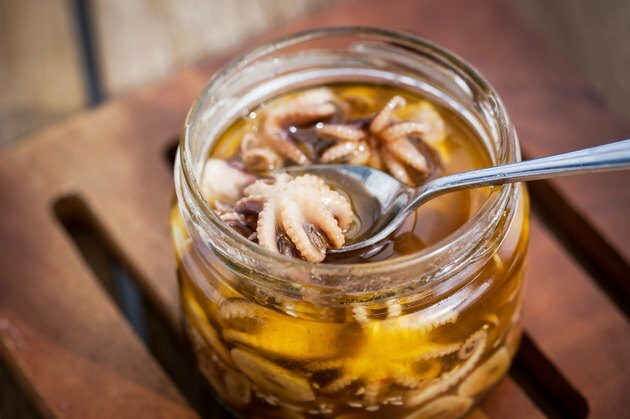 Each 100-gram, or 3.5 ounce serving, of cooked octopus provides 152 milligrams of EPA and 162 milligrams of DHA, for a total of 314 milligrams of DHA plus EPA. This means that you would need to eat about six servings of octopus per week to meet your recommendations to get 1,750 milligrams per week, as in the 2010 Dietary Guidelines from the U.S. Department of Health and Human Services. Octopus does not provide alpha-linolenic acid, the short-chain omega-three fat. Get your daily recommendations for alpha-linolenic acid, or ALA, from plant-based sources, such as ground flaxseed, walnuts, canola oil and soybean oil. The most concentrated source of ALA is flaxseed oil, according to the Linus Pauling Institute Micronutrient Information Center. Fatty fish and shellfish are good sources of EPA and DHA. Salmon, sardines, anchovies and herring are also rich in calcium and vitamin D, and shrimp and scallops are low-calorie sources of omega-three fats. Each 100 gram serving of cooked octopus has 164 calories and 4 grams of carbohydrates, with no dietary fiber or sugars. Octopus is low in total fat, with only 2 grams, and it less than 1 gram of saturated fat, which raises your cholesterol levels. Each serving has 30 grams of protein, or 60 percent of the daily value. Octopus is high in iron, vitamin B-12, vitamin B-6, niacin, vitamin C and calcium, but it is also high in cholesterol, with 96 milligrams, or nearly one third of the maximum amount healthy adults should have in one day.